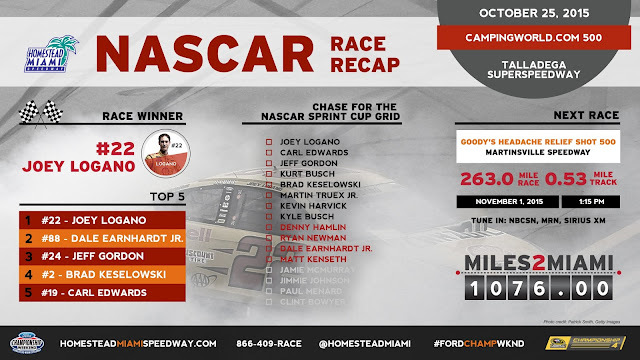 Joey Logano won the 47th Annual campingworld.com 500 , his 14th victory in 251 NASCAR Sprint Cup Series races. This is his sixth victory and 26th top-10 finish in 2015. This is his first victory and fifth top-10 finish in 14 races at Talladega Superspeedway. Dale Earnhardt Jr. (second) posted his 16th top-10 finish in 32 races at Talladega Superspeedway. It is his 19th top-10 finish in 2015. Jeff Gordon (third) posted his 20th top-10 finish in 46 races at Talladega Superspeedway. Matt DiBenedetto (40th) was the highest finishing rookie. Joey Logano leads the point standings by 27 points over Carl Edwards. With the completion of the CampingWorld.com 500 at Talladega Superspeedway, there are now only 1,076 Miles2Miami. Eliminated from the Chase for the NASCAR Sprint Cup: Denny Hamlin, Matt Kenseth, Dale Earnhardt Jr., Ryan Newman. © 2014 Homestead Miami Speedway. Powered by Blogger.